So, as the newly elected Admissions Interview Video Coordinator (I get to plan the video, write the script, film it, and also coordinate the student greeters and tours for the two interview blocks of the day) for the MUN Interview Nov 15th, I guess the time has come to talk about the interview process. But honestly, the MMI is a complicated animal. It’s probably the most important interview that you will ever face (and certainly the most important one up until now) and it is unlike any other. Many universities, especially in Canada, will put 50-100% of admittance on the interview, meaning that your 4.0 and your 42 MCAT won’t help you anymore. That said, the MMI is not as terrifying as I just made it sound, really. I applied for three cycles and had 5 MMI interviews, and my attitude towards the MMI changed dramatically during those cycles, let me tell you. Before my very first MMI at Dal in my first cycle, I was so nervous I could barely make myself choke down a few crackers. At my MUN MMI, we had to wait two hours because the morning group ended up taking longer than they thought, and they provided us with sandwiches as compensation. But, honestly, even my opinion of the MMI changed as I went through the stations. For those lucky readers of mine who are applying to schools that don’t use the MMI and therefore don’t know what I’m talking about, the MMI stands for the multiple mini interview. It’s several (6-12) ten minute stations, where you have two minutes to read a prompt (usually ethics, behavioural, collaborative, problem-solving or just a random) and then 8 minutes to make your case, state your position, do a task with another interviewer, or, my least favourite, role-play with an actor. I know, I’ve made it sound so awesome, but honestly, once you get into a rhythm a few stations in, the MMI can actually be fun. The trick is to put aside the importance of it and just get into the actual experience of it…but that doesn’t mean you’re going to do well on it. And make no mistake, you can feel great and do pretty poorly on the MMI. How I felt about the MMI was never a good barometer about how I did on it. I thought I’d done great at Dal and got rejected, and I thought I’d bombed Queens and got wait listed. Well…ok, yes, to a certain degree. “Be yourself,” isn’t bad advice – you definitely don’t want to lie, or to be someone other than yourself, because that will get you red carded faster than no eye contact (pro tip, eye contact is so important. Also talk with hand gestures – I makes you seem engaged) but “be yourself” isn’t helpful advice. It doesn’t give you a strategy, or tell you anything about what the MMI is about, or what it is looking for. Because it is looking for something, and it is possible to prepare for that something. You can, and must study for it if you want to do well, and aren’t just the best interviewee ever (and even then, prep is a good idea). Now, the question becomes, how do I do that? Lot’s of resources are available for preparing for the MCAT, but surprisingly few are available for the MMI. Most universities that have a med school that uses it will offer some kind of practice sessions (practice questions, practice format) and although those can be helpful, they aren’t going to tell you what the MMI is looking for, or give you a strategy. My first two cycles I prepared by doing practice questions with other applicants, working on my time management and trying to make my answers not repeat, but I never had much idea about how the test worked, the categories of questions, what getting “red carded” meant (pro-tip, it’s basically an automatic zero for the station, and can range from not enough eye contact to breaking down crying) and so I had no way to “play to the test” so to speak. 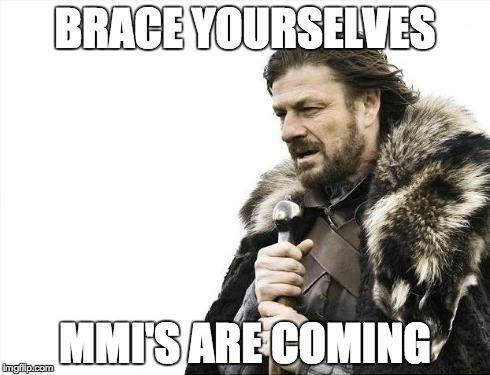 And then I got an email from a student group I was in, telling me about an MMI Prep session by something called the Medical Admissions Consultants. I checked out their website, listed below, and was intrigued although a little skeptical, because I’m a cynic. Now, anyone who clicked, or will click on that link is going to notice that the first problem is that the program (1 day, 9am-5pm, with 1 hour of Skype practice at a later date) is $750.00. Which is certainly not chump change, let me say that outright. And, because there might be a few people who feel the same way now as when they read a Buzzfeed article only to realize it’s paid ad at the end (bite me, native advertising), let me come right out and say, I’m not advertising for this service for profit, or saying that you need to take this course. It’s a lot of money, and it really depends on how you feel about how ready you are for the MMI. What I am saying is, I absolutely thought MAC (their acronym) was worth it. It’s hosted by two doctors, Dr. Kuzel and Dr. Kurian, and these guys are the real deal. They served on MMI committees, and they have the answers to the question “what is the MMI looking for?” Their session told me what to know, what types of questions there are, gave me a strategy for each type, and really made my answers professional. I know other people who used them and got in. I can’t post here the info from their session (because that would be illegal) but it’s amazing info, and I absolutely would if I didn’t respect those two doctors too much (and also didn’t want to get sued). My suggestion on using MAC would be, if you feel like you just can’t figure out the MMI, are really worried about interview skills, or this isn’t your first cycle and you feel like you can budget the money for it, than it’s a worthy investment. If none of those apply to you, then try your universities free resources, practice with friends, use the free posted questions you can find online, and do the best you can to prepare in other ways. Also, if you aren’t Canadian like me, and you are doing a traditional panel interview (which Queens, U of T, MUN and possibly another school in Canada do as well as the MMI) the same advice goes. Find practice questions online, practice with a friend answering questions. Look up the school you are applying to for their interests (MUN and rural medicine for example) and look up some recent health issues. Take a position on some obvious ones (euthanasia, etc.) and dress up for your interview. Take the rainbow coloured dye out of your hair and the nose ring out. I even took my second ear piercings out – you want them to remember you, but not because of that. Wear a suit, or a blazer and a skirt (ladies), get a haircut, a tasteful, understated manicure (ladies again) and wear shoes you’d feel comfortable wearing to your grandmother’s house (gents too, but again, mostly ladies on this one – leave the cheetah heels and patent red leather at home). This is the biggest job interview of your life, so dress like it. Prepare however you can, but don’t be that person whose just going to “be himself” and wing it. That person knows nothing (Jon Snow). Game of Thrones jokes. I love them. But honestly, prepare, and just do your best. It’s all you can ever do, really.